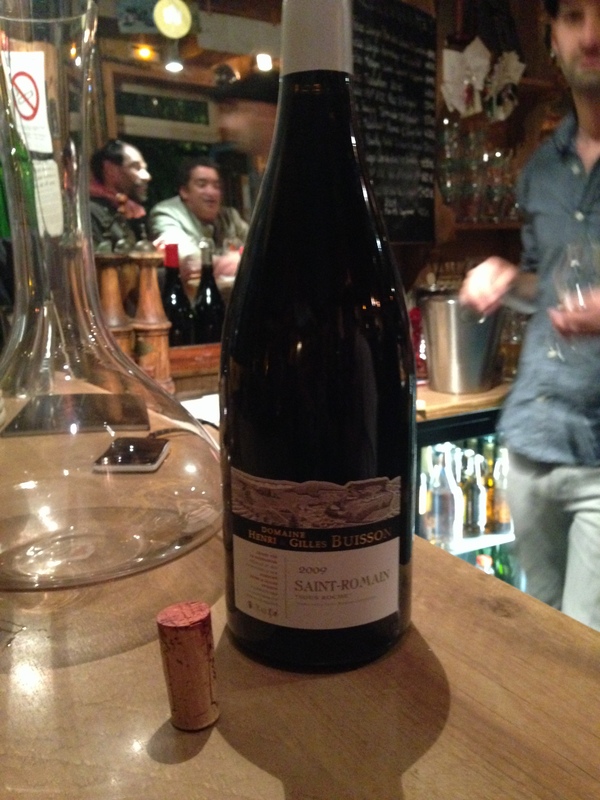 (May 22, 2014) – Our last appointment of the day was at 4:30 at Clos de Vougeot, the ancient wine farm of the Cistercian monks who studied the soils of Burgundy and recognized the unique terroirs that could be found just a few meters apart. 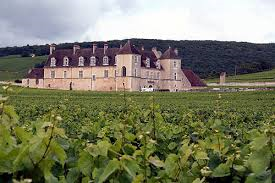 It was their early work that helped to determine the Grand Cru and Premier Cru vineyards of the area. The sky was darkening with threatening rain clouds as we approached, making the medieval structure look even more forbidding. We entered and toured the old cellars and everyone was amazed at the three ancient wooden wine presses that were each as big as a house. Next we saw a film which described how the Confrérie des Chevaliers du Tastevin acquired the Château in 1945, and turned it into the seat of the Order. On the way back to Beaune, we turned off at the small village of Vosne-Romanee, home of the famous DRC – Domaine Romanee Conti, which produces the most expensive wines in the world. 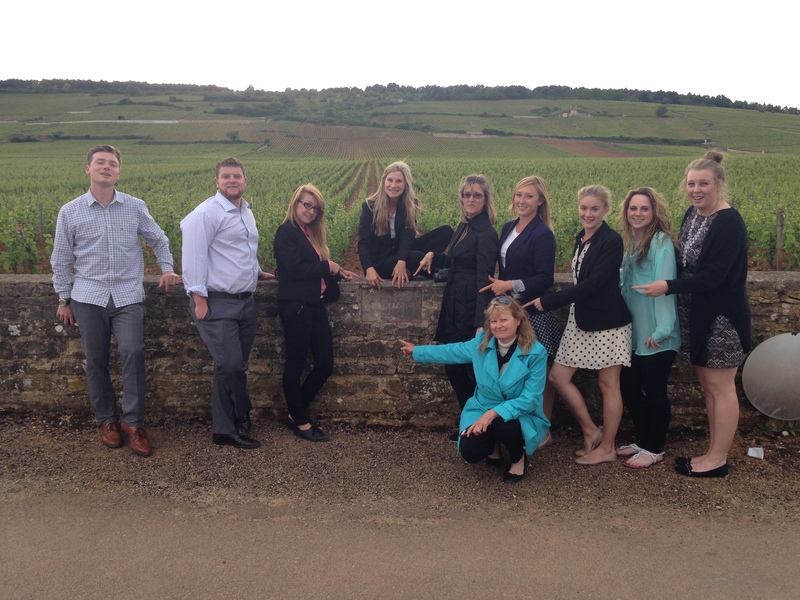 Our goal was to visit the world-famous vineyards of Romanee Conti and La Tache, but the bus couldn’t make it down the narrow streets. 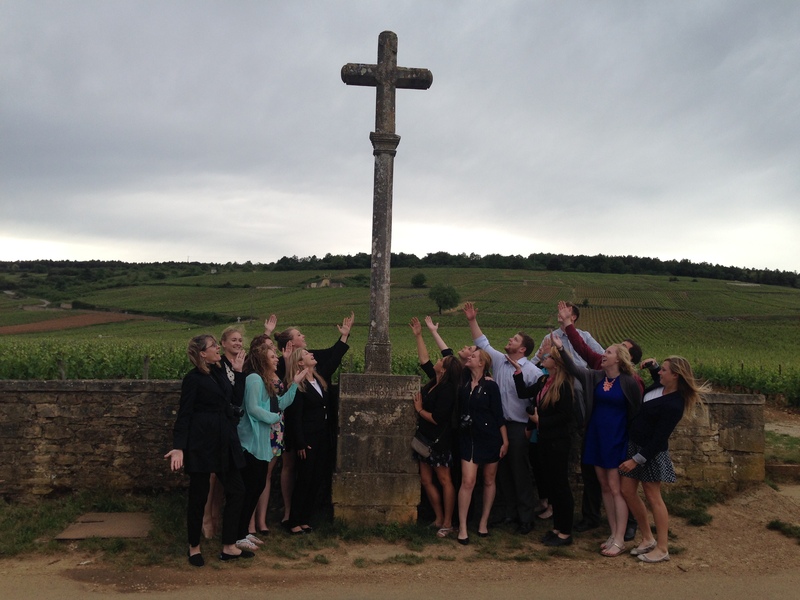 Therefore, it deposited us in the central square and we walked about 5 minutes until we saw the famous cross of Romanee Conti. Fortunately the rain held off so we could take some photos. Next we walked through the vineyards with their graceful rock walls until we found the small stone plaque that read La Tache. Here we paused for more photos, marveling at how each of the small vines in the vineyard could produce a bottle of wine that averaged more than $3,000 per bottle. Back on the bus, we drove about 20 minutes until we were back at our hotel. Everyone dressed for our last group dinner that was taking place in the Le Panorama restaurant overlooking the vineyards. Though we had heard many positive reviews about the restaurant, our experience was rather disappointing in that the multiple choice menu we were promised did not appear, and instead of being served the pinot noir of the domaine, they served us a flabby pinot from Vin de Pays d’Oc in the Languedoc region, but with a label from a local Burgundian producer. When we complained, they brought us a cheap regional Bourgogne that was thin and acidic. Therefore, abandoning the dessert of floating islands that most people disliked, we congregated in the lobby to share a toast of cremant in which each person described a highlight of the trip. Then most of us deserted the disappointing restaurant and headed into Beaune for a last night on the town and a very fun time at the Bar du Square. This spot is where most of the local winemakers go, and it became a favorite haunt for many in our group all three nights we spent in Beaune.